Today is also the Epiphany; here in Poland the day is colloquially known as “Święto Trzech Króli” or “Feast of the Three Kings” (or just “Trzech Króli” for short). You can read more about the history of the day, and Amish observance here: Amish Old Christmas. Here in Lebanon County, PA, never heard of Old Christmas till two weeks ago, it is not observed here, might be a generation gap. Apparently it is a Mid-West movement. I have some friends of mine who are Old Order Mennonite and they honor Old Christmas, today. 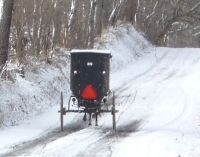 Many Marathon NY Old Order Amish folks left for Smicksburg, Pa yesterday to observe Old Christmas with their families. I’m not Amish or Eastern Orthodox (who celebrate Epiphany on January 6), but we do “observe” Old Christmas (Jan 6)as the end of the Twelve Days of Christmas, as a day to “deforest” the house and put away the decorations. My husband was raised in the Pittsburgh area. Many people there (a group my husband refers to as “Serbian”) celebrate Old Christmas: the question my mother-in-law asks every year is, which group will get the white Chistmas? We seem to have some confusion here on Old Christmas, the Old Calendar and Epiphany. On the new, or Gregorian calendar, Christmas falls on December 25, and Epiphany – the revelation of the messiah to the gentiles (3 Kings as representative) – on December 6.The Eastern Orthodox church, in some of its branches, has not changed its liturgical (church) calendar from the Julian to the Gregoiran, so all their festivals and holidays fall 13 days after other churches’ holidays. It is a coincidence that there are 12 days between Christmas and Epiphany and 13 days difference between the Old and the New Calendars. This confusion causes some people or groups to call Epiphany Old Christmas, but it is also called Little Christmas in Scotland and other northern places. I have said before that I (and other scholars) believe that the Amish were an isolated Orthodox group surrounded by the Roman Catholic church. So, really, Old Christmas is January 7. For convenience, it may have been conflated with New calendar Epiphany. Thanks Magdalena, yes there is some confusion. I should have noted in my mention that “3 Kings”/”Trzech Kroli”/Epiphany is a different occasion (I clarified above). And did you mean Epiphany as Jan 6 (not Dec 6)? It so happened that when the calendar changed, Christmas fell on Epiphany, which was established long before. Yes, it is true that if the original reason to hold to January 6th was still valid, it should now fall on January 7th. How quickly we forget! We celebrate Epiphany in the Episcopal Church. The service at my church is always very nice. We do a feast of lights–as the scripture is read recounting the Biblical story from Creation to Christ, candles on the altar are lit. It’s also the last time to sing Christmas carols until next year. Then we un-decorate the church and burn the dried out greens in the bbq pit out back. At home, my mother always kept the Christmas tree up until Jan. 6 (because that’s how it was celebrated in Europe–her mother was born in Germany, her father in Poland—I’m not sure if “Old Christmas” is celebrated on Jan. 6 in both places? Do you know, Erik?). While I don’t always leave the tree up that long, I do always leave SOMETHING Christmas-y up until Jan. 6 to follow our family tradition (usually it’s a nativity scene). I was wondering if anyone knows of any Amish custom involving the Three Kings in particular? In Poland the priests make parish visits to the local homes to give a blessing. Apartment doors are chalked with the letters K+M+B (for the 3 kings) and the year to mark the custom. In Poland as far as I know it is the Epiphany alone; not sure what practice is in Germany. The city of Krakow also has a tradition of creating nativity scenes incorporating historical buildings of the city. These can get quite extravagant and there is even a competition each December. I believe that the Russian Orthodox still celebrate Old Christmas, as a friend of mine always does. He got the tradition from his russian mother. In Holmes County, I knew of a few Amish families who did, but it seems most did not. The Epiphany or Little Christmas is a tradition in the Roman Catholic church too, although it will more likely be observed in homes that did so as a family tradition historically. Liturgically Christmas officially ends with the Feast of the Baptism of the Lord. In some Convents and Monasteries, Christmas decorations do not go up until Christmas Eve, then everything comes down after the Baptism, although in some Catholic churches this will be done after the Epiphany. It is my favorite Liturgical time of year. In our home our tradition is to begin decorating the week before Christmas, then after the Epiphany everything but the Creche comes down – then Creche is lovingly put away after the Feast of the Baptism – which this year will be observed on January 8th. I am not a fan of the way our church made so many feasts “movable”. It is so interesting to learn how the Amish observe. The Hutterites observe this day as well. I wrote a short piece at: hutt-writevoice.blogspot.com . Thanks for the history on this day Erik! Hi Linda, I did not know that, but thanks for letting us know. I enjoyed seeing that on your blog, and also the snow photos. And in some Catholic Churches, traditionally, the Christmas decorations are actually left up until 40 days after Christmas, which is a feast called Candlemas, or the Purification of the Blessed Virgin Mary. Evidentially one tradition is to not eat meat on Orthodox Christmas. Although my family are not observant “Greek Catholics” anymore, by coincidence, my immediate family and I ate Rainbow Trout and potato this evening for dinner. There is a kielbasa in the fridge, but I didn’t eat it, just because I wasn’t hungry for it. Happy Christmas to those who are more observant than my family is. Someone mentioned that in Holmes County, they didn’t know too many who celebrated Old Christmas. However, I live in the area, and at least these days almost all Amish and many Mennonite businesses are closed for Old Christmas on January 6.